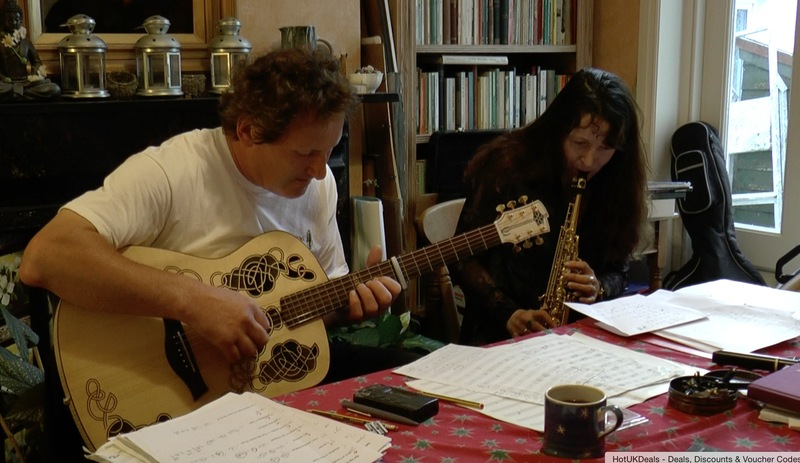 Carolan has passed some time in Bristol with Rob King and Pippa Marland, founders of the celtic-jazz-fusion band Carmina. Since their formation in 1987, Carmina has toured extensively, including Australia, Spain, Belgium, Ireland and France, and released two studio albums produced by the legendary Donal Lunny as well as a live album. They have also been nominated for the Hot Press Best Roots Album and The Irish Rock Music Awards Best Traditional Act Awards! My first reaction to the idea of the Carolan guitar was to think about my own musical instrument, and how I would love to be able to find out about its past in the same way that players and audiences will be able to delve into Carolan’s story. I play a silver Selmer ‘cigar cutter’ saxophone, made in Paris in the early 1930s. When I got it from a junk shop in Bristol in 1992 it hadn’t been ‘set up’ for many years. One of the old leather key pads had the date 1948 written on it – the last time it had had a full overhaul. It would be fascinating to know something about the history of its creation and about its early days before it fell into disuse and disrepair. Did it stay in Paris for a while, or was it shipped off straight away? Did it play big band jazz? Did anyone compose tunes on it? Was it heard in Club Bobino, and did it meet Duke Ellington? The other thought that crossed my mind was that the sound an instrument makes with any one particular player is unique. An instrument has its own voice: when you run your finger across the strings of a guitar you get a sense of its integral ‘sound’. But the combination of a particular player and that instrument will create its own new and distinctive collaborative voice. Lucille would sound different if it wasn’t BB King playing her, and when you hear jazz records you know, if you’re familiar with their different tones, whether you’re hearing John Coltrane, Dexter Gordon or Sonny Rollins, even though they all reputedly played Selmer saxes. How fantastic if, through your instrument, you were able to hear the sounds that other musicians had created with it, and if you could send on to the next player a record of the sound you made. 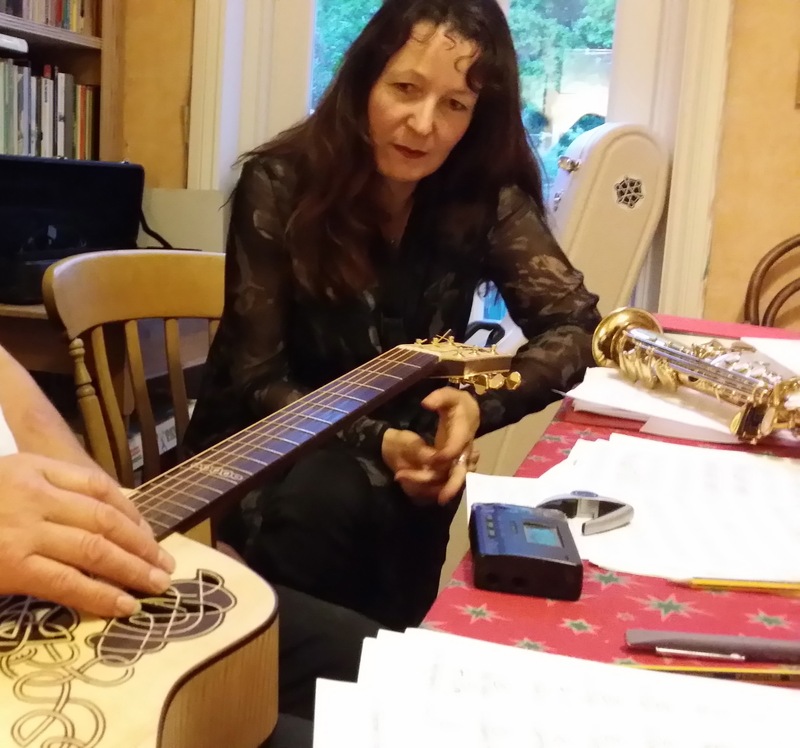 On bringing the guitar to Bristol to spend some time with the guitarist Rob King and with our band Carmina, I wondered what the combination of Carolan and Rob’s playing would sound like. How would it interact with the other voices and instruments in the band, and how would it influence our compositions? I was also interested in the question of how location would play into this – the idea that music is shaped by the places in which it is created and played. I wanted to use the opportunity of having the guitar with us to work on a new song that combined the themes of Bristol, memory and the role music plays in our lives. Rob quickly came up with a chord progression and finger-style pattern on Carolan. It was interesting that he was thinking first and foremost about how to respond to the physicality of the guitar – he talked about its lightness and fragility. He also wanted to allude musically to the name of the guitar. In a nod to its namesake Turlough O’Carolan, he experimented with ways of making the guitar sound like a harp. He put a capo far up the fret board and created an intricate continuum of sound. I found, in trying to match a melody to Rob’s musical ideas, that it seemed to work better to allow the vocal line to be quite free – to weave around the harmony rather than getting into step with the rhythm and chord changes. This was quite a new approach for us. 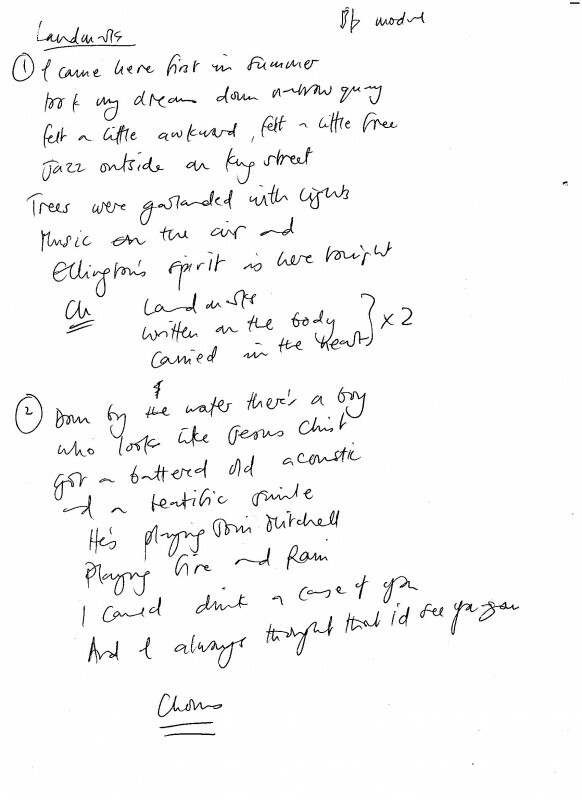 While I was writing the lyrics I was thinking about the idea of the guitar’s ‘memory’ and trying to use my own memories of Bristol to give the song a specific location. I came to Bristol first when I was eighteen to study at the university. A lot of my memories of that time are bound up with music. I used to go to the Old Duke on King Street to listen to jazz, and sometimes the bands played out on the street. My favourite area of the city was the central bit around the harbour. I’d walk down Narrow Quay, where the plane trees were lit up at night, and I busked outside the Watershed, on the opposite side of the water. There was often a guy there playing songs by Joni Mitchell and James Taylor – he was beautiful and serene, but at the same time kind of lost-looking. I was really into the contemporary music of the time too. I can remember where I was when I first heard The Smiths’ ‘This Charming Man’ – standing on the corner of Woodland Road, listening to it on my friend Nic’s Walkman. All these strands of music carry memories from that time with them, but have also been built on by memories from other more recent times. Maybe Carolan can enact the same kind of slow accretion of memories and associations, with each part of its journey building a new layer. 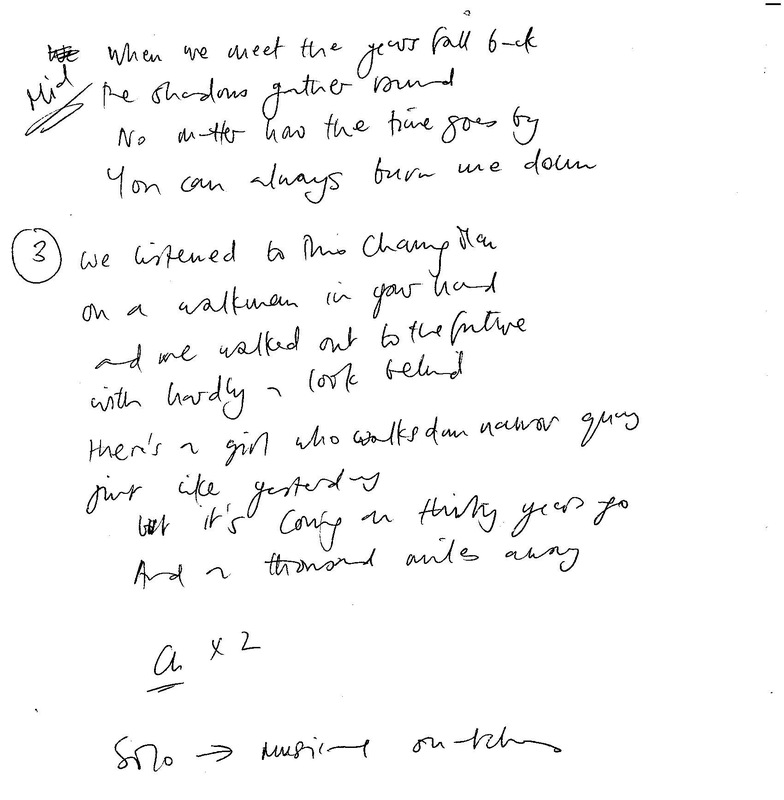 It was something like that I wanted to evoke with the chorus: “Landmarks, written on the body, carried in the heart”. I also felt that ultimately there may be something a little ghostly and uncanny about the guitar – that viewing its history might bring with it that slightly uncomfortable feeling you get when you look at old photos – a feeling of loss, nostalgia, elegy. I thought, though, that this might be counterbalanced by the notion of the guitar as a kind of conduit for a river of music flowing into the future. In the interview, Rob and I had the idea of using one of the codes on the guitar to map to a composition that one person might begin and then subsequent guardians of the guitar adapt and develop. The song ‘Landmarks’ is our contribution to the Carolan guitar’s memory, and it’s also a memento for us of having had the guitar with us for a while. Every time we play the song we’ll think of the guitar. I’d also love to know where the guitar goes next and to be able to keep up with all the new experiences it’s going to accrue. My ideal souvenir of the guitar would be a scan-able code (maybe inlaid in something unexpected like a brooch or a small wooden box) that would act as a kind of portal to where the guitar is at any future point, telling you where it is, who’s playing it, and what they’re creating with it. This guitar was first given to me on 23rd April 2015, at Pippa’s house, where her daughter Katie filmed me opening the case and seeing it for the first time. I’d seen pictures of it on the website before this, but of course it was very different to be opening the case and holding it in my hands. My immediate feeling was how beautiful and slightly strange it looked – also how light it was to hold, and how fragile it felt. I sat down with it and, as it was already tuned to DADGAD, I played a bit of the Carmina version of ‘Lord Franklin’, the accompaniment to which I’d been playing for years in that tuning, even before I met Pippa. I then had the great privilege of having the guitar with me for several days. At first there was a bit of extraneous turmoil in my life, and I didn’t want to touch it until I was more centred – so after a few days I took it out of its case again, and looked at it in more detail. The Celtic designs seem to be worked in mostly hardwood, like ebony, but the body of the guitar is in a much lighter wood – possibly in spruce, but with a ?maple back – I was expecting a heavier wood for the back, but that’s because I’m a fingerstyle player, and luthiers usually use a very hard wood (e.g. walnut) for the back and sides of the guitar for that style of player. However, I felt that the guitar’s bright tone, which I really liked, was possibly caused by the lighter wood. I wanted to write something directly on to the Carolan guitar, and this ‘light’ quality of it made me feel that it was very fragile – so I was prompted to write something very delicate. Carolan has always been an important figure for me, and for several years I actually played Celtic harp in preference to the guitar – I was strongly influenced by Alan Stivell, and I loved his accompaniment style, especially in his version of the Irish lament ‘She Moved through the Fair’, where the accompaniment to the vocal is a very light repetitive figure which doesn’t seem to bear much relation in its rhythm to the vocal line – so although there’s a lot a delicacy, there’s a lot of tension as well, which to me is the perfect combination – I mean as an accompanist, which is my role as a guitarist in Carmina. So I started playing the guitar in DADGAD (also called by e.g. Bert Jansch as ‘D modal’), but I put a capo on the 8th fret to bring it to Bflat. 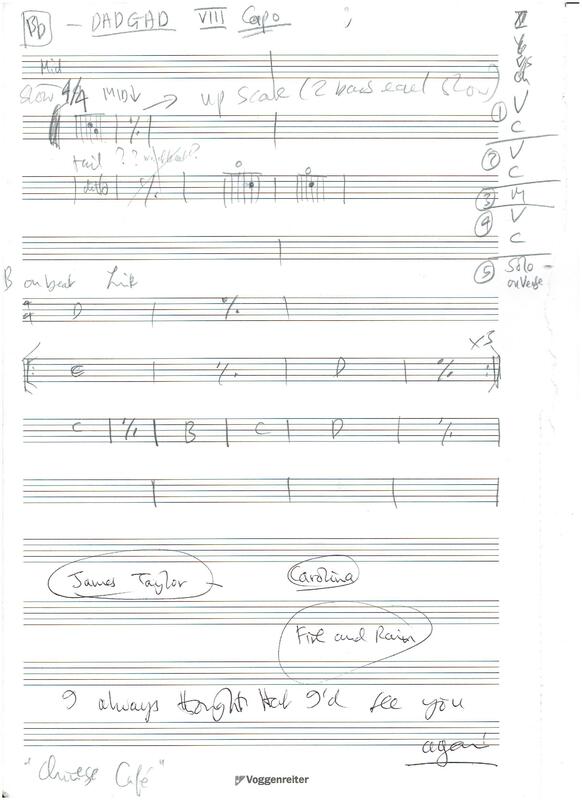 I then started to play a simple figure in 4/4, but with the accent on the 2nd and 4th beats – I didn’t think about this at all, I just played it, but in hindsight it seems that the off-set accent adds to the delicacy of the piece, being prompted perhaps by the delicate sense I had of the guitar itself. This idea became a song, which Pippa and I worked on and then performed for the first time during our interview with Alan. During this interview a lot of new ideas came to life – I had been puzzling about the guitar and its significance during the time I had it, and as I’m not at all technical I couldn’t fully grasp the nature of its being an ‘interactive’ guitar – I still don’t really understand how the interlace symbols really work in a digital way, and more importantly I can’t quite grasp what the potential actually is, although I suspect it could be huge. Pippa is much more able to grasp these ideas than I am, but during the interview I think both Pippa and I were really focussed on the guitar’s significance to musicians who are actually out there playing – to me it seems that the guitar could act as a kind of ‘medium’ between all the different players that have it in their possession – but also that ‘a sense of place’ could be very significant as well. Towards the end of the interview we came up with the idea of the ‘souvenir’, and this prompted me to think along a kind of parallel line – that the guitar couldn’t give you an actual physical souvenir, like a plastic model of the Eiffel Tower or plaster-cast of Michelangelo’s David – but it could perhaps in being handed from musician to musician present to the holder something of the artistic gifts of it previous ‘owner’. This sounds very metaphorical, but perhaps might be made real through the digital medium. I mean that the actuality of it being handled and played by someone you admire could become a kind of ‘ongoing’ souvenir – when you hold it and play it again perhaps something of that player’s power might be transmitted to you – the analogy of a seance comes to mind! It was a great privilege to be offered this instrument, and I am very happy to be part of what I see as the beginnings of something that could have profound artistic and creative benefits. I’ve put ‘technical’ in inverted commas because I’m actually not technical at all, but I’d like to make these observations from a guitarist’s point of view. 2. My first impression of the guitar acoustically was that it was sounding balanced across the strings, but having played it for over a week I feel that it does vary a bit across the fingerboard – e.g. the third and fourth strings (i.e. the G and the D) have a bigger resonance above the fifth fret. I was wondering whether this might have something to do with the peg arrangement on the bridge – most guitars these days have horizontal holes to thread the string through, whereas the Carolan guitar has a more ‘traditional’ peg arrangement – could this cause the slight imbalance I’m hearing – i.e. the mid-range of the guitar being more resonant than the rest? Carolan’s out and about making new friends.